Such a sweet card! Thanks for playing along in the Friday Funday Challenge! Now this is indeed a cutie. I love his colouring and that you have used so many snippets up . Thank you for fluttering into the butterfly garden for this challenge. Hugs Mrs A.
AW! soooooo cute, love the image and your embossed background. 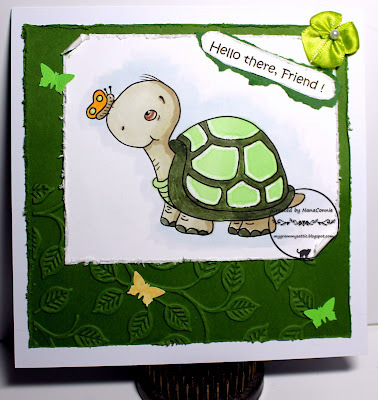 What a fun card Connie - and I do love the sweet turtle/tortoise! Your upside down cat on a header never fails to make me smile here BTW! Super cute image on this gorgeous card.